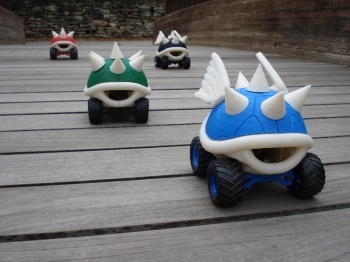 In an effort to arm everyone against the menace of go-karting plumbers, Skimbal has publicly released plans for a line of RC-controlled koopa shells. Let me paint a scene for you. You live in Los Angeles. It's late July. You're a high-powered executive and your boss asks you to take a basket of fine cheeses to a pool party being hosted by Diddy ("P.", not "Kong") across town. You glance at your smartphone, and are alarmed to see that it's 4:30PM. Traffic! Los Angeles traffic! You leave the building, shoulders slumped, knowing that both you and the gruyere are likely to melt in the California sun, trapped behind a mile-long line of SUVs and pimped-out Civics. Being a member of the Nintendo generation however, you have a crazy, possibly sun-stroke-induced idea. "What if I had a blue shell? I could clear the entire 405 and then Princess Peach would bake me a cake!" Obviously at this point you're hallucinating and Diddy is going to be very sad when he doesn't get his cheese. Alright, so explosive koopa shells are still the exclusive property of the Mario Kart universe, but thanks to Skimbal (aka Michael Curry), a Missouri architect, you can now pretend to launch clusters of red shells at will. Admittedly, Skimbal's hyper-detailed plans -- freely available from Thingverse -- will require that you have access to a 3D printer. Otherwise the whole thing is a relatively simple process of snapping parts together. Now try to imagine three of those things streaking at you in the rearview. I bet you'd cry.